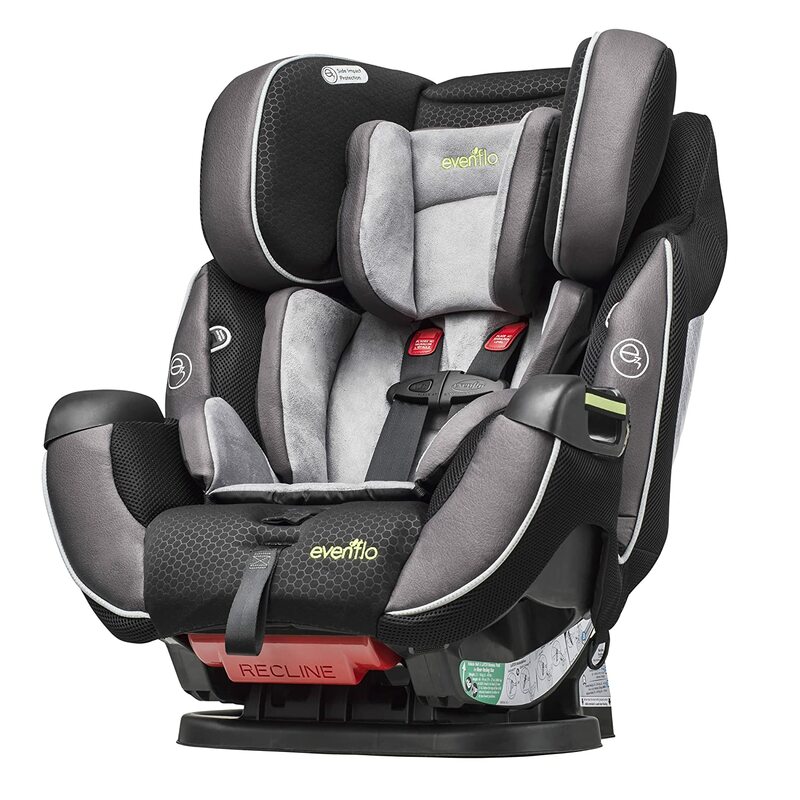 Evenflo is another top-rated brand when it comes to car seats. Their Symphony Elite All-In-One convertible car seat is a proof for that – and is practically the seat that you will ever need that provides all of the capabilities you need. What is the latest price for this seat? Speaking of, there is a rear-facing, forward facing and boosting seat mode and the Symphony Elite car seat can protect infants from 5 lbs to children weighing up to 110 lbs. Probably the best thing about this product is the fact that it pairs convenient features such as buckle pockets that help against hot buckle burns and the anchor system known as SureLATCH which automatically tightens and allows securing the car seat in the proper position. Are you a MOM or DAD that would love to get tips for Car Seats Safety and a FREE Guide? Some of the leading magazines in the industry have rated the Evenflo Symphony Elite with five stars. The brand is one of the best pioneers in the industry. Unlike the typical convertibles, it can accommodate children from 5 to 110 lbs. The Symphony car seat can be used as rear-facing, forward-facing and as a belt-positioning booster seat. However, we need to clarify that there are two different models of the Symphony Elite car seat currently available online – the Symphony DLX (a.k.a. Symphony Elite) which is the premium model with SureLATCH connectors and the SymphonyLX model which has differently shaped headwings and standard push-on lower connectors as a replacement of the “SureLATCH” technology. Today, we are reviewing the first model (which is more expensive and with more details too). There is a range of seating options available for this chair. Offering premium safety and convenience, this model is rollover-tested and has bucle pockets and OUTLAST Performance Fabrics which absorbs both hot and cold temperatures for optimal thermal comfort. The technology has the ability to absorb and store excess heat all while reducing overheating. Additionally, this car seat allows the child to stay at a balanced temperature and prevent any chilling during the cooler months. This will give your children a warm seat, where the stored heat is released. Your child will stay dry and enjoy the comfort of the reduced perspiration. The SureLATCH technology allows maximum ease when installing this car seat in the rear-facing and forward-facing modes. It is quick and easy – however needs a glance at the instruction manual. The Evenflo also provides a nice tip if you are having trouble with the LATCH belt and its tightening. When it comes to the LATCH weight limits, the maximum weight when rear-facing is 40 lbs. In the forward-facing mode, the child can weigh more than 40 lbs. and in that case, you should use seat belt plus tether to install the seat instead of using the lower LATCH anchors in your vehicle. 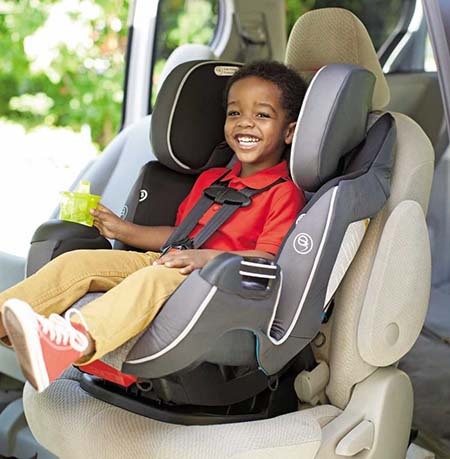 The Evenflo car seat also allows the seats to be installed in the center seating position with the LATCH technology – only if the spacing between the lower anchors is 11” or wider OR if the vehicle allows it. The only thing you need is to make sure that you are not blocking access to an outbound buckle. The Tether straps should not be used for rear-facing – only for forward-facing – if the tether anchor allows it. Evenflo recommends using the top tether for all the forward-facing installations regardless of any installations or different child weights. 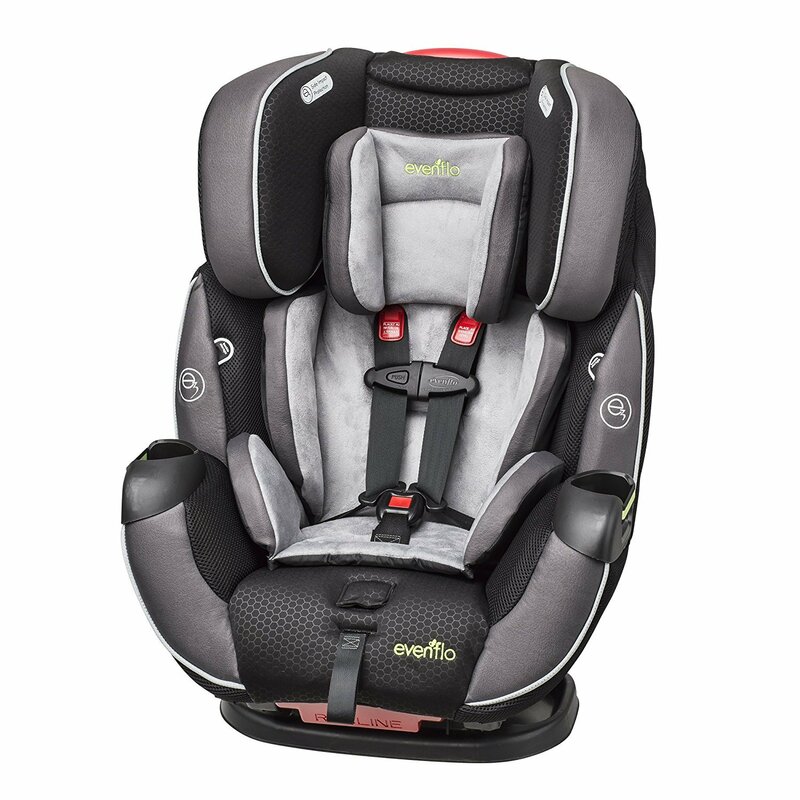 The Evenflo Symphony car seat features three recline positions on the base. For rear-facing, there are three recline positions on the base – #1 which is fully reclined and used when installing the seat in the rear-facing mode. When switching the SureLATCH connectors from rear-facing to forward-facing and vice versa, there is a unique method of switching the LATCH strap. You need to unhook the bottom of the cover, lift it up, follow the directions in the manual and finish the setup. Evenflo has different recline positions for forward-facing for any child weighing between 22 and 40 lbs. When switching through them, you can use either the semi-reclined (#2) position or the fully upright (#3) position. You can also use the fully upright (#3) position and install it with seatbelt and top tether. In the Booster mode, you must use the fully upright position (#3). However, you can continue to use the LATCH attachments to secure the seat to the vehicle. How Does The Evenflo Symphony Car Seat Fit Different Children? There are many comments on the fit of the Evenflo car seat for children in different ages. Below, we are listing some of them. For newborns, the seat fits well but in some cases, you need a rolled up washcloth to fill the gap between your baby’s body and the crotch strap. This is because there is only one slot position. For a baby that is 20” long, the head may be pushed against the chair which is not exactly something you want to see. However, this is only when using the Symphony pillow – so in any other case the newborn baby is positioned well. Any kid that weighs less than 40 lbs and is shorter than 40” can enjoy the Evenflo Symphony car seat in the best way possible. However, this is only a case in the rear-facing positions. If you are looking for a toddler seat for forward-facing positions, the comfort is not that good because of the headrest height positions. In this position, the Evenflo Symphony has probably the best rating from many organizations. It does a great job when positioning the seat belt properly on kids that are over 40 lbs. – but is not very tall in booster mode. However, it perfectly fits many kids in booster mode until they are big enough to ride in the cheap backless booster. However, you need to help them buckle when using the seat in this mode. 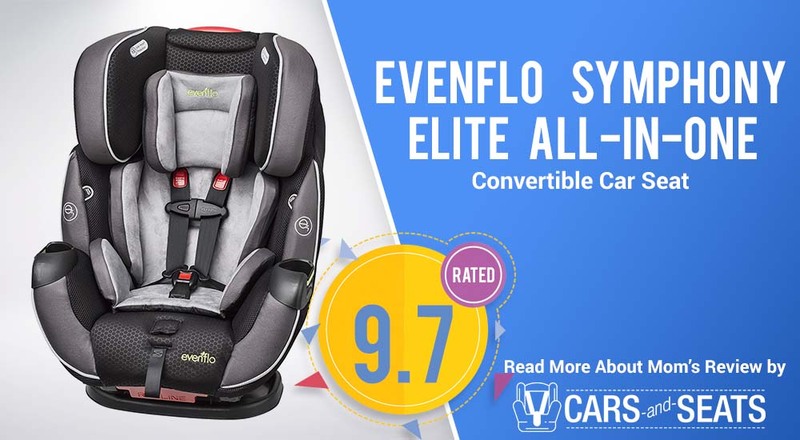 The overall ‘cushiness’ of the Evenflo Symphony convertible car seat is on a high level in every single style. If you are living in a place where the climate is very hot, the Platinum model with the OUTLAST technology might be the best choice. However, for short trips, the basic model is definitely good and worth considering. What’s also important to mention are the buckle pockets which are very convenient and won’t press your children – just like they won’t give them a burn when the buckle tongues are exposed to direct sunlight in hot weather. The cover is also relatively easy to remove, replace and put in the washing machine. Even though it takes some time to remove it because of the dual cup holders, it doesn’t cause problems and should be machine washed separately in delicate cycles with cold water and mild detergent for the best possible results. In the end, we are wrapping this review up with a look on the model’s main pros and cons. The Latest Price for this Seat? Car Seat Prices tend to vary. Press the button bellow for the latest price. In the end, the Evenflo Symphony offers a great value for money. It is safe, comfortable and promotes a great sleeping position for children in different ages. Because of that and the quality materials used, it is a great product with a lot of unique and innovative features. The seat is also easy to install and the harness straps tighten and loosen easily which doesn’t create too many problems. Even though the Booster position is not enough tall, all the other positions are good – making the Evenflo Symphony car seat a great choice for parents, child care providers, grandparents as well providers and agencies interested in finding the perfect car seat. Our tip is to always try before you buy – and get the best decision that tailors to your needs!